The effects of lysine and hormones on amino acid and glucose venous outflow in the skin and the whole body were determined in Angora wethers (n = 5). The goats had chronically catheterized superficial branches of the deep circumflex iliac artery and vein of each side. Four experiments involved the intra-arterial test infusion on one side (60 min) of lysine (0, 0.16, 0.8, 4 mg/h; Exp 1) alone and lysine (4 mg/h) together with infusions (60 min) of successively increasing doses of insulin (0, 0.1, 1 and 10 mU/h; Exp 2), cortisol (0, 0.15,1.5 and 15 g/h; Exp 3),and triiodothyronine (T3), 0, 0.02, 0.2 and 2 g/h; Exp 4). The other side served as control and was infused with saline only (10 mL/h). Lysine concentrations in venous outflow from the control side (80.9 M) were unaffected by lysine infusion, whereas venous lysine concentrations in the test side were 82.1, 85.7, 96.9, and 109 M during infusion of 0, 0.16, 0.8 and 4 mg lysine/h, respectively. Although venous concentrations of insulin ( 22 U/mL) were similar (P>0.05) and unchanged in both sides for all doses of insulin infused, the highest dose of insulin infusion (10 U/h) decreased (P<0.01) lysine and glucose venous concentrations in the skin. Plasma variables were unaffected (P>0.05) by cortisol despite six to ten-fold increase in the plasma cortisol concentration. The highest dose of T3 (2g/h) increased (P<0.02) T3 from 250 to 450 ng/dL, decreased (P<0.01) plasma concentrations of the branched-chain amino acids (BCAA) by approximately 20 - 30% and phenylalanine concentrations by 80%, and increased (P<0.01) glucose concentrations by 36% equally in venous plasma on both perfused regions. 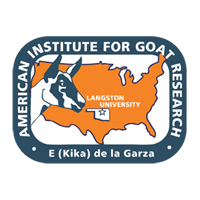 These results suggest that whole body BCAA and glucose concentrations in Angora goats are highly responsive to doubling of physiological concentrations of T3, but apparently unresponsive to acute (60 min) pharmacological increments in plasma cortisol concentrations. Knowledge of the interaction between nutrients and hormones in the skin will allow better ration formulation and development of local growth promotants.